Marketing managers wear many different hats in their position. One of these includes being a social media manager. Social media marketing is the newest and most popular marketing tool out there. Everyone, from Fortune 500 companies to small business, uses social media sharing to market their products and services. As a marketing manager looking to stay abreast on current trends in your field, you may want a little more guidance in understanding how to reach the widest audience possible with your posts. 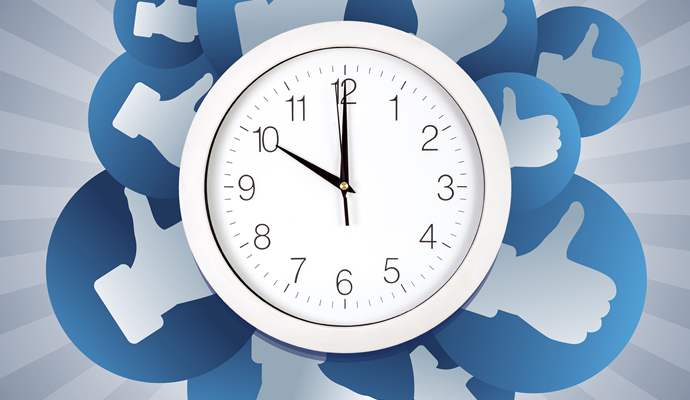 This post will cover several different factors and social media tips that contribute to the best time to post. What Platform Are You Posting On? Although it may be easiest to share your post to the big social media networks simultaneously, that may not be conducive to reaching the widest audience possible. Each social media platform may experience peak traffic and interaction at different times. Twitter, for instance, experiences most engagement on the weekend whereas Facebook peaks midweek. Keep this in mind when you draft up a post and you may be able to maximize your post’s reach. What Timezone Does Your Audience Reside In? This is a key factor that many marketing managers do not consider in their sharing. If the majority of your desired audience does not reside in the Eastern Standard Timezone, take that into consideration when researching the best times to post on each social media platform. Most of the research and findings you will find online regarding traffic and best times to post will be referring to EST in the data they post. If your target audience is in another country, you may also want to do some research on usage data specific to that country. Always remember to consider the information you find specific to the timezone of your desired audience, in addition to always practicing utmost social media security, otherwise your post timings may not be as effective. Use a consistent style when formatting social media posts for business. This is a secret used by some of the best social media marketing companies. Consumers like knowing what to expect. You want your posts to follow some type of formatting style guide for each platform. Make sure that the formats that you choose reflect your business’s brand, as well as the specific platform’s purpose. You do not want to have huge blocks of text under your Instagram posts. Instagram is a mostly visual platform. Keep consistent when it comes to formatting your posts. This will lead to higher engagement. When Would You Be Most-Likely to Browse? When do you find yourself most likely to hop on Facebook for a bit? Does that coincide with the time you are most likely to actually engage with posts? What about the other social networks? Do you tend to visit them all at the same time? If not, when do you visit and engage on those platforms? Asking yourself these questions can give you a starting point to test out some posts and gather data with Facebook Analytics and similar. If you feel that you may not be a great representation of the audience you would like to reach, find someone who is. Ask them these questions. This can be a great tool to help you do your own research on when posting is best for your company specifically. What Does Common Sense Tell Me? Well for one thing, common sense should tell you that certain platforms will not help your advertising campaigns reach as wide an audience as others. LinkedIn, for instance, is one such example. This may mean that when these platforms aren’t operating at peak usage, your post may not be seen by even a handful of users. LinkedIn is a professional network, do you think people are likely to log on during a Friday afternoon? No, of course not. The work week is winding down and they are ready to go home and rest. Use this common sense with other platforms as well. When people are going out with friends and family on the weekend, do you think they’ll be posting and engaging more frequently? Probably so. Just use common sense and you will be more likely to reach as wide an audience as possible. Does It Make You Say “Oh Wow!”? When it comes to social media sharing, before you post anything, you should always ask yourself if your followers will be impressed or excited about the content. If not, forego sharing. The end goal for all your social media efforts is to have your posts widely shared, even your holiday marketing posts. If your followers look at your post and say “Oh wow!”, they are much more likely to share it with their friends. Be sure that any content you share will impress your followers to reach the widest audience possible. If you find yourself taking on social media duties and needing to know the best time to share, consider these ideas so that you can reach the widest possible audience for your marketing post. Consider various factors like which social media platform you plan on sharing to and what timezone your target audience is located in. It may be helpful to ask yourself when you typically use and interact to get an idea of when your audience may as well. Above all, always use common sense before posting to any network. Keep these timing tips in mind before hitting the share button, and you can be sure you did your job to the best of your ability to post at the best possible time for your company and increase your company’s brand differentiation.